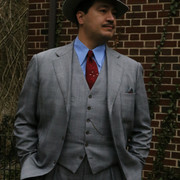 1950s Stetson 15 with my bespoke 1930s style POW check belted, actionback suit, and a bespoke 1930s spearpoint collar shirt in cotton end on end. Email: Send Chasseur an email. Private Message: Send Chasseur a private message.